Once you get to a certain age, you will find yourself constantly on the look-out for skincare that firms, tones and tightens skin. I never gave much thought to such products when I was in my 20s and back then, there were hardly any anti-aging skincare around or perhaps they weren’t as publicised as they are today. 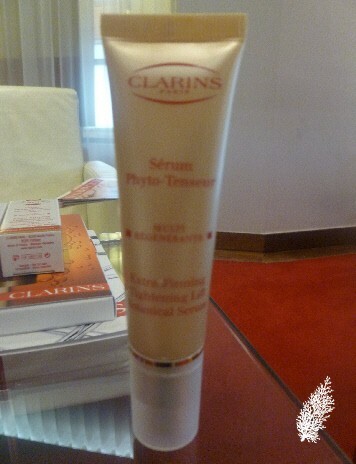 Clarins has a number of anti-aging skincare, the Extra-Firming Tightening Lift Botanical Serum being one of them. This serum is described by Clarins as the “ultimate non-surgical “face lift”. Clarins’ concentrated anti-aging serum is said to help firm and tone contours on face and neck — with benefits that are immediate and long-lasting. Soothing botanical blend — including firming Oat Sugar and line-minimizing Hibiscus — creates an invisible “mesh” on the skin’s surface to help tighten and reshape facial contours. However, I think it may be stretching it a little to say that this product can replace surgery, lasers and injections. This is a very light and fluid serum which absorbs quickly into skin. I find it slightly sticky, my skin feels a bit tight for a few seconds after application. How do you use this with Clarins Double Serum? According to the Clarins facial therapist, the Extra-Firming Tightening Lift Botanical Serum is to be applied after the Double Serum. The Extra-Firming Tightening Lift Botanical Serum is always to be applied before your moisturiser so if you have other serums, apply them before the Extra-Firming Tightening Lift Botanical Serum. Clarins Extra-Firming Tightening Lift Botanical Serum is 30ml/RM255. Review is based on sample of the product. You are so young! Maybe in another 3 years. I should start using this heheheh….